Good teaching and good research go hand in hand. When it comes to research and innovation, the Department of English consistently achieves a level of excellence unparalleled by most. Our groundbreaking, globally renowned undergraduate research has continually led to industry-evolving innovations. 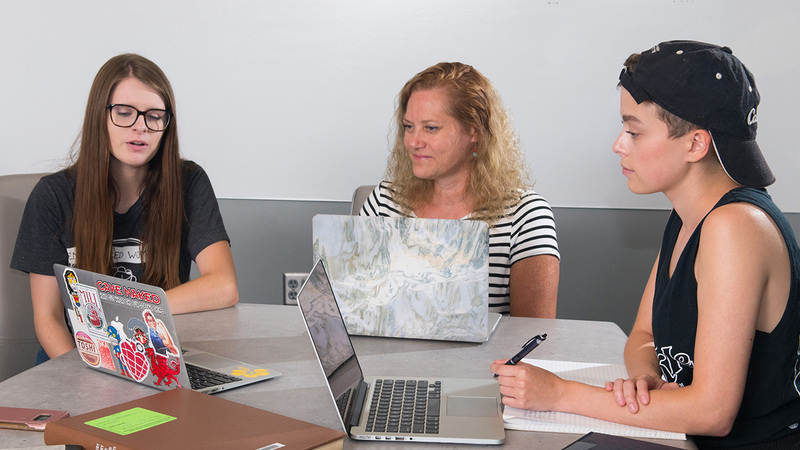 Enrolling approximately 100 graduate students and composed of approximately 40 graduate faculty, the Department of English conducts research in a multitude of areas, including Literature Studies, Digital Humanities, Film Studies, Composition and Rhetoric, Creative Writing, and Place Studies. Undergraduates researchers work one-on-one with faculty through the university's Undergraduate Creative Activities and Research Experience (UCARE) program. Out M.A. and Ph.D. programs in English emphasize interdisciplinary cultural approaches to literature, multicultural and gender studies, the retrieval and production of texts, and critical frameworks for literature and pedagogy. Many of our faculty are nationally recognized scholars; several have received national or University awards for their research excellence. Many faculty also serve as editors or on the editorial boards for national and international journals.